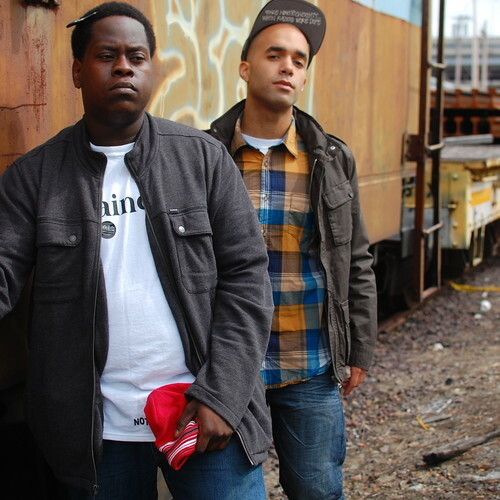 Hailing from Brockton, Massachusetts, Vydle Sinez and Incredible Chuck form the ultimate hip-hop union of Notoriety. With a passion for all elements of creating music, their recent project, ‘The Ground Table,’ highlights the importance of branching away from the individual. Instead they focus on coming together as a community by collaborating with all of their favourite MCs in the Boston area. Now with five mixtapes under their belt, and several tours around the States, the lads are continually striving to push themselves further into making an impact on the future of hip-hop. They are currently working on a new project with Brockton producer, ‘Phil the Pain,’ and their next album, ‘G.E.M: Side A’ is currently under production. We chat to the lads about the response of their recent collaboration project ‘The Ground Table,’ how their passion for making music together started from primary school, and in what elements they strive to be notorious. Ayla Dhyani writes. You just released your project, ‘The Ground Table”, featuring numerous artists and MCs in Boston. Tell us about the process behind bringing the community together. Vydle Sinez: The whole thing was based off the relationships we had going on. Bringing all of the music together was on our behalf, working with everyone individually and even recording with some together in studio. Incredible Chuck: The process for ‘the Ground Table’ took about 18 months during which we worked with 12 artists and 5 producers. We were working with many of our favourite Boston MCs on previous collaborations, then as more collaborations came into play the end result was an entire project. We had the opportunity to work directly with many of the people on the project, which we feel was a key element in bringing us all together. How has the response been in Boston? Vydle Sinez: Boston has always shown us Brockton guys love. This tape is definitely our most popular, and it gels together so well being centred on Boston indie MCs. Incredible Chuck: The response in Boston has been very good. We received the local support we gave through our project right back from local blogs, fans and artists. The events for ‘the Ground Table’ were also a success, and were instrumental in the promotion of the project. Notoriety has been described as an entity. Tell us how the group came about. Vydle Sinez: We came together in 2009 as Notoriety. Before that we were rapping under 'the influence' but that was all immature stuff (laughs). Chuck and I are childhood friends so it's a family affair. Incredible Chuck: The group started in third grade with Vital Silveira and myself. Matt Whitlock also grew up in the same area of Brockton as Vital and I, and has been a long-time friend since the seventh grade. Sam has also been a friend since the eleventh grade, and both Sam and Matt have backgrounds and education in management. Vydle and I started with the group and our two long-time friends had faith in us and decided that they wanted to be a part as well. You are both dedication to many elements of music from production to rapping. What do you want to be notorious for? Vydle Sinez: Personally I'd like to be notorious for sticking to my guns and being a Gainer. Incredible Chuck: I would like to be notorious for rapping and singing the most, but I also want to get better at several other elements of music like beatboxing, production, and piano. What has been the biggest milestone for you both so far? Vydle Sinez: I'd say the Battle of the Bands show at the Hard Rock we had a few years ago. We won first place in the first round. Mind you, Chuck and I were up against fully formed rock bands (laughs). It was just us and a flash drive with our instrumentals! Incredible Chuck: One of the biggest milestones we have had was winning the first round of Battle of the Bands as the only hip-hop group in the competition with no band, but we also recently signed our first distribution deal with company in New York. Vydle Sinez: Next up is our album. We're recording it right now. Titled 'G.E.M: Side A'. No dates so far but updates will come. Incredible Chuck: What’s next for Notoriety is a couple more projects with a more concrete focus. We are working on a very soulful new project with Phil the Pain, a local Brockton producer. Also planning to possibly tour in the next year or so. There are more things on the horizon but that’s all we can mention for now. Vydle Sinez: Honestly my life experiences. I'm in my late 20's and I'm processing things differently now. Chi is always centered. Incredible Chuck: Piano, guitar, Lauryn Hill, nature, water, Mo-Town, women, weed in no particular order.